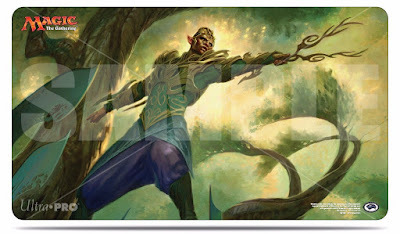 Last Monday, in this MTG article, we had yattered briefly about the rise in popularity of the Saheeli / Felidar Guardian combo decklist. 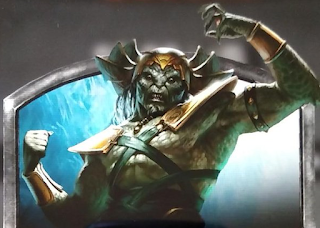 This past weekend's Richmond StarCityGames Open standard format results confirmed Saheeli and provided a second emerging list - Black Green Delirium / Black Green Aggro, which shared a number of key components. It may be of interest to pop on over to this reddit thread for the Magic: the Gathering community's discourse on the results. We have a history here at MTG Realm of not playing the 'popular' decklists, but rather brewing up our own sometimes rogue lists. We did take note of a single 'Humans' list being played by Benjamin Nikolich (linked over here) which inspires us. 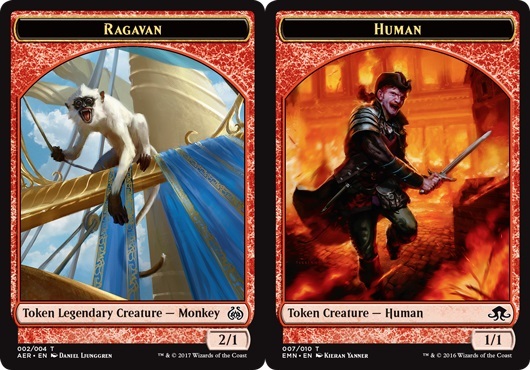 In fact, our post last week on our take on post Aether Revolt Humans was not altogether different from that of Benjamin's list. The active ingredient in our opinion in this list and perhaps our favourite card in Aether Revolt is Metallic Mimic, which along with Thalia's Lieutenant pushes the tribal strength. We certainly are not 'all in' on the humans strategy - we do love out be-goggled Monkey very much. • As expected, Metallic Mimic and Thalia's Lieutenant are must have bombs. 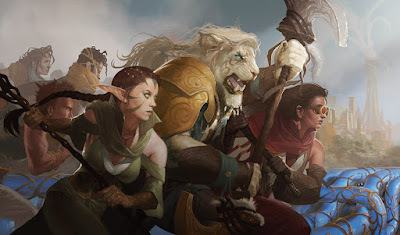 • Give the number of Monkey tokens from Kari Zev and Hanweir Garrison, Hanweir Militia flips / transforms rather easily in that larger board threat. • Gryff's Boon is still a solid choice for evasion and to answer a flying Vehicle. We hope to cover a few odds 'n' ends with today's post, so buckle in and lean in when we negotiate the road curves. Today on the Magic: the Gathering Mothersite, the ubiquitous Blake Rasmussen delivered upcoming Friday Night Magic promo cards to take gaming fans to June 2017. 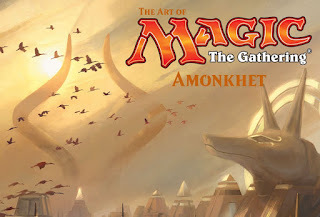 Friday Night Magic (or FNM) is a format of Magic: The Gathering tournaments, held on Friday nights in gaming stores and associations all across the world. These are designed to be a beginner-friendly introduction to organized play. The promotional cards, provided by Wizards of the Coast as prize support for the FNM Events are foil and feature an alternate art. We are rather happy with the choice of Aether Hub - here's a card that will likely see proper standard constructed play and not be relegated to a dusty trade binder. If you have not already done so, please do take in today's Magic Story installment ‘Puppets’, penned by James Wyatt (we're always very pleased to read his offerings). This continues the Kaladesh story of Aether Revolt and features Liliana, who has a bone of contention to pick with the Planeswalker Tezzeret. In this article we hear the first mention of the Plane of Amonkhet (the next MTG Block). Following up with yesterday's post on the new Magic: the Gathering standard constructed season, we wish to elaborate on to our very first build. 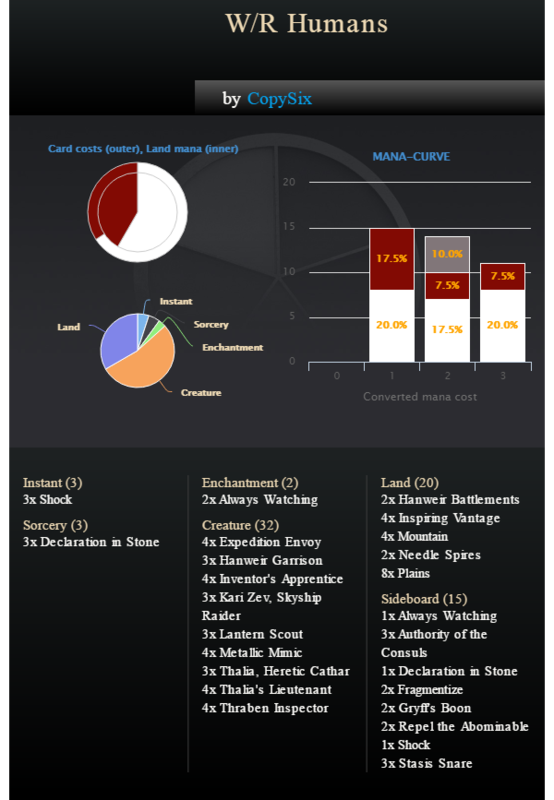 This decklist was essentially planned several weeks ago with the target to make the most use of an existing decklist we already had all or most of the components to and then supplementing it with new Aether Revolt cards. Why? Because the market for pre-ordered card singles is tumultuous and a minor modification to an existing list is safe harbour. We do have a predilection for Tribal strategies since we first started playing MTG in Lorwyn and we have had some small measure of success at Friday Night Magic with Humans. 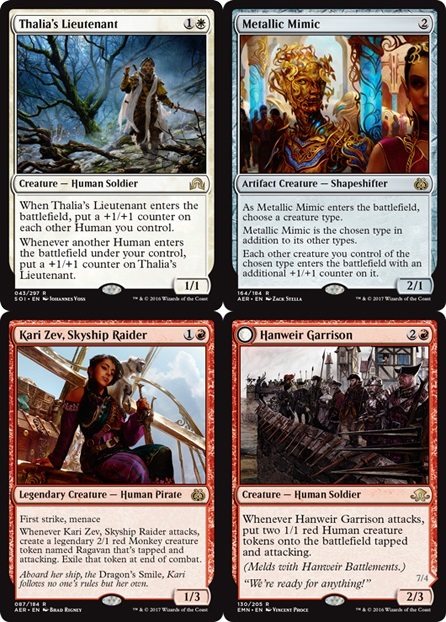 The beating heart of the early Human build was Thalia's Lieutenant (bringing +1/+1 counters), a pump effect with Always Watching, and a bunch of 'white weenies'. There are some very solid choices to be made in secondary colours of Red and Green as well. To this end, here is our very first decklist with new Aether Revolt cards for this Friday Night Magic event at our local gaming store, OMG Games, here in Barrie, Ontario. Standard White / Red Humans (evaluating for new post Aether Revolt) appropriate for a Friday Night Magic play environment. Bulk of cards carries over from previous sets. Approximate cost (paper) should be close to $100, putting this build near to budget players. Use of new AER Metallic Mimic to add synergistic support with Thalia's Lieutenant. Using new AER Kari Zev, Skyship Raider which fits onto curve into 2-drop, limited evasion with menace. Shock, Stasis Snare (has flash!) 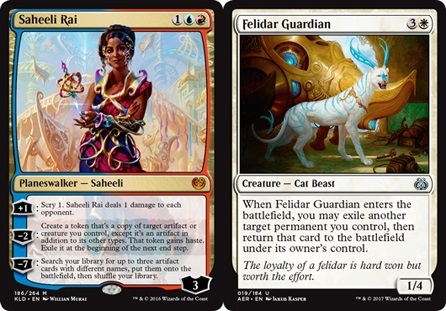 and Authority of the Consuls may be beneficial when playing against new standard combo of Saheeli Rai + Felidar Guardian. 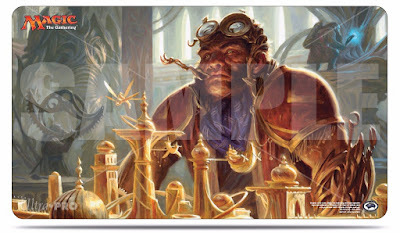 Sideboard card choices are entirely dependent upon your local meta-game. We plan on playing this for a few weeks to get a feel as to how soft our local meta-game is to this. Should things go sideways and we require a much faster deck (to take on the new CopyCat standard combo), then we have packed a parachute with a Red / Green energy decklist which we will yatter about in our (hopefully) next post to MTG Realm. 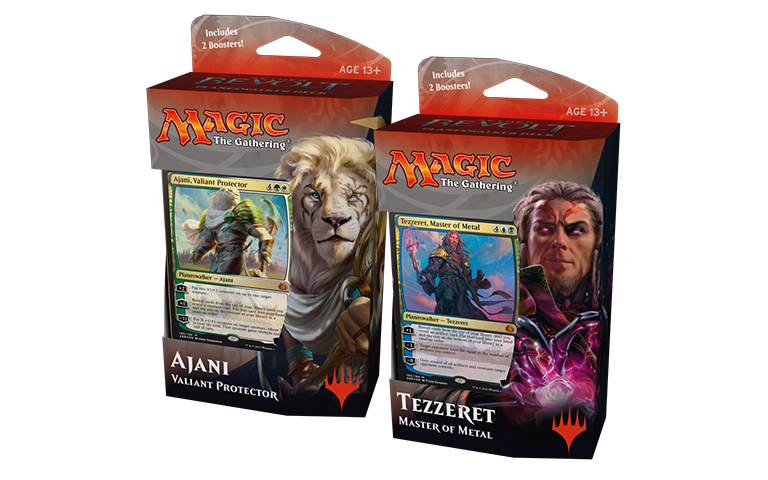 The first large Magic: the Gathering tournament, after Friday's release of the new Aether Revolt set took place in Columbus, hosted by StarCityGames. As in previous years, many players look to the early results from Columbus to evaluate how the the early standard constructed format may evolve over the next several weeks. 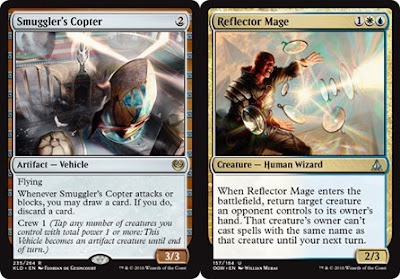 This particular tournament is also noteworthy as it is also the first major tournament after the much-discussed banning of the very popular (and arguably over-powered) Smuggler's Copter and Reflector Mage. So, how did hundreds of gamers battling for over $8,000 in prizes adapt to the new environment? Perhaps not surprising, many were playing the new two-card combo of Saheeli Rai and Felidar Guardian, and had also prepared sideboard (or mainboard) answers to this threat, either by playing against the anticipated field or by anticipating numerous mirror-matches. 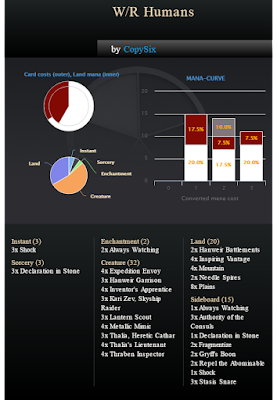 In fact, 25 of the top 64 decklists (or ~ 40%) contained these card pairings. Watching coverage whenever we had a chance over the weekend, we did note how popular both Torrential Gearhulk and Verdurous Gearhulk had become. Good luck finding these cards still 'in stock' on line or at your local gaming store. 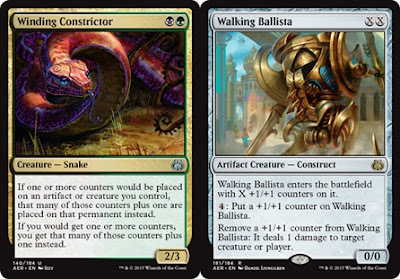 We personally very much like the G/B Aggro use of Winding Constrictor, Walking Ballista and other synergistic cards to grow (or remove) threats, but have planned our first decklist to take to Friday Night Magic to be something else altogether. We took an immediate liking to Metallic Mimic and have found inspiration from MTG writter and player Adam Yurchick to put to good use in a tribal Humans list. Adam did place 43rd during SCG Columbus with a W/R Humans, which is our direction as well but we are torn by the dicision as to stay with White Red or perhaps attempting a White Green list. 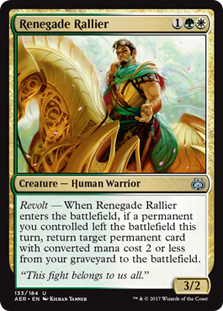 Perhaps the way forward with Humans is going Green White or splashing Green for a three colour Naya list with such cards as the very likable Renegard Rallier ? It is finally the Aether Revolt Launch weekend! 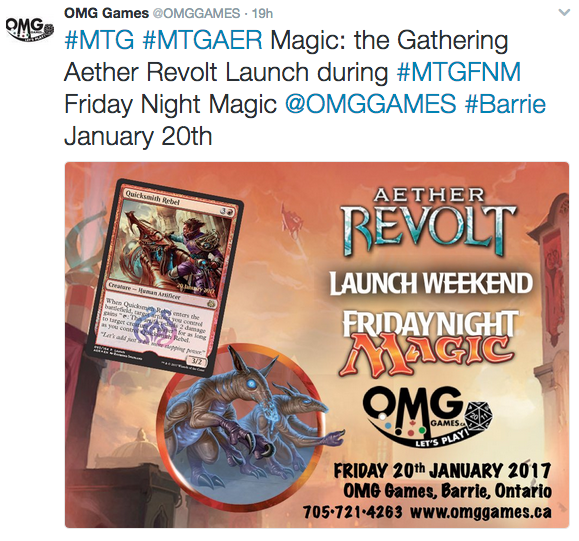 This means that when we pop down to our local gaming store, OMG Games, here in Barrie, Ontario this evening to play in the regular Friday Night Magic event, we will score the Aether Revolt Launch Promo, Quick Smith Rebel. With the average retail price at about $35 (US), the value of the rares / mythic rare along with the single Fatal Push was certainly adequate to 'pay for itself'. We have been collecting the Player's Guide / visual card encyclopedia for a number of years and also rely upon the card storage box itself to organise our growing collection. 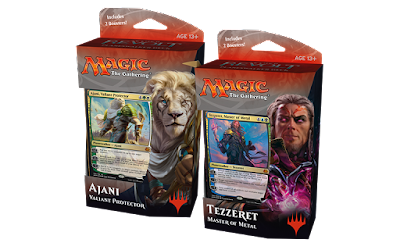 The newest Magic: the Gathering set is hitting gaming store shelves near you this very Friday in time for Friday Night Magic. We've heard through some friends in the States that the street release date may have been broken by undisclosed distributors and / or retailers, but have no further evidence to provide. 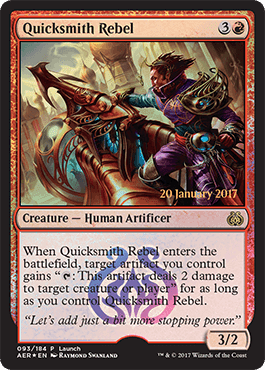 Anywhoos, be sure to head to an Aether Revolt Launch Event, and you may score a sweet date stamped alternate art Quicksmith Rebel promo card. 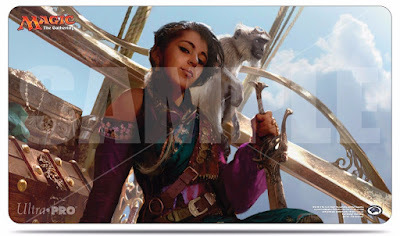 • The next Magic Story is posted over on the mothersite. This short story installment in the continuing Kaladesh / Aether Revolt Fiction fest is 'Breaking Points' and is penned by Doug Beyer. 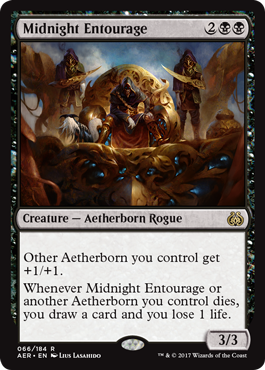 • Abe Sargent over at Gathering Magic has his Top Ten list of best Aether Revolt Cards for Commander, multi-player and other variants. • Todd Stevens over at StarCityGames has produced his list of Top Twenty best fav cards for standard constructed, and it is of little surprise that some of our fav new cards we'll want to get our paws on is on this list. • One foil copy of a mythic rare planeswalker, designed to be fun and flavorful but not pushed for tournament play. Expensive to cast and splashy. 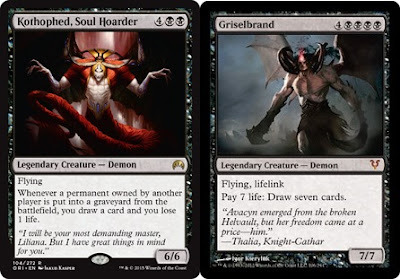 • Two copies of a rare spell that has an effect and also tutors for the specific planeswalker. The rare usually will cost one mana less than the planeswalker. 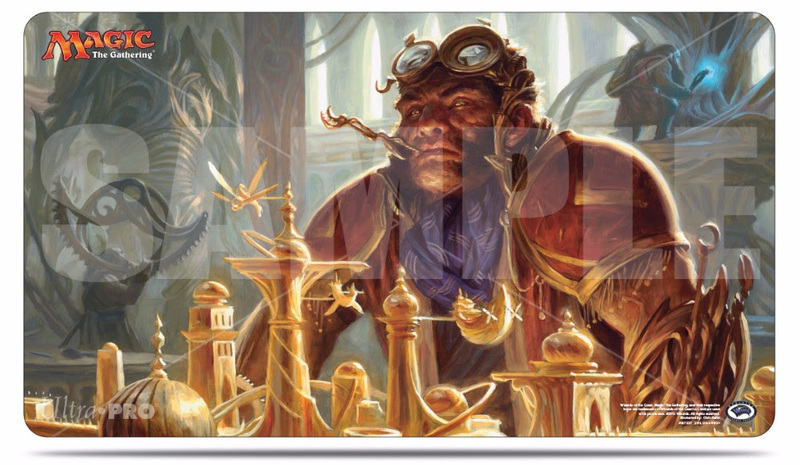 It only looks for the Planeswalker Deck's version of the planeswalker and not any version. • Three copies of an uncommon permanent that is enhanced by having the planeswalker on the battlefield. • Four copies of a common flavored to the Planeswalker with a basic staple effect. • Four copies of an appropriate common dual land. 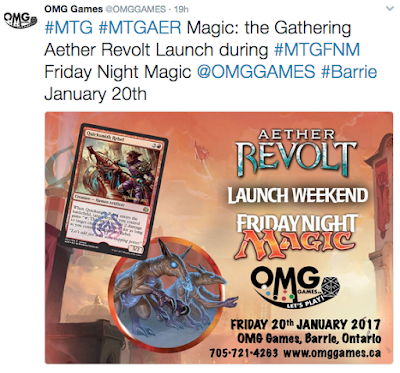 As we post, the Aether Revolt battle is still raging on at local gaming store, OMG Games, here in Barrie, Ontario. 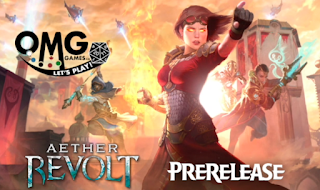 They are running what is essentially back-to-back Magic: the Gathering PreRelease events since Friday midnight and will eventually close out the weekend with a Two-Headed Giant Aether Revolt event later this evening. We reserved a seat on Saturday morning and bumped in a number of friends, including 'Andy' who not only brought his two kids but several others from his neighbourhood. The card pool was shockingly shallow in white, blue, and black. Cards in Red and Green provided a good selection along with the Artifact cards to put us firmly in this direction to build with. The end result was a Red / Green list with some themes for Energy and +1/+1 Counters. 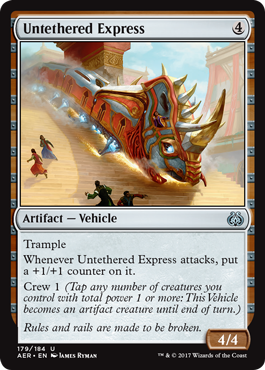 Our most favourite card played in the event had to be Untethered Express, which laid down a beating a won games by itself if it was not answered soon enough. We also need to acknowledge a singleton of a fog-effect card - Commencement of Festivities, which was used to great effect at least three times over our matches. Specifically, an opponent would commit all to combat, gets nullified by CoF and would be completely exposed on our next turn. Final result was 2 wins and 2 losses to put us out of reach of any prizes, but the real prize was all the friends we met and a great time had. As it is Friday, you may be planning on heading in to your local gaming store this evening (we'll be at ours - OMG! 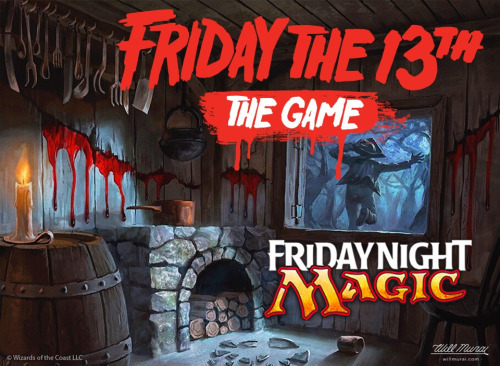 Games, here in Barrie, Ontario), we suggest you may wish to take along a decklist featuring Triskaidekaphobia - we don't think there is another Friday the 13th until October when this mucho flavour card will no longer be legal to play in standard format. Righto - on to the big thingy - its the Aether Revolt PreRelease this weekend. Find a game near you at that link we've posted. 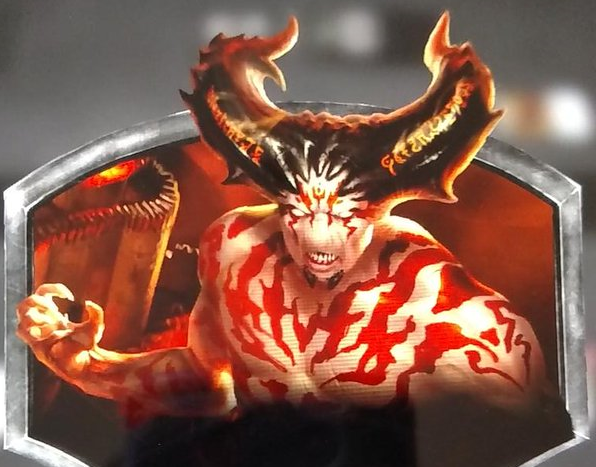 Serious Magic: the Gathering players will have already been soaking up all the great articles put out by the countless MTG strategy websites, but since the crew here at MTG Realm are casual / standard constructed to the core we will sadly admit, we've not kept up with the reviews for limited / sealed. To that end, we have found a very lovely resource to crash study the limited game before we head off to the PreRelease (in just a few hours from now) - we'll strongly recommend popping over to Limited Power. This great site organises the reviews of four reviewers and pretty much everything is selectable / custom-able (all real words) so that you can zoom on in to the info you are after. Some gamers in the Magic: the Gathering community are understandably salty with the recent Banned & Restricted update earlier this week. 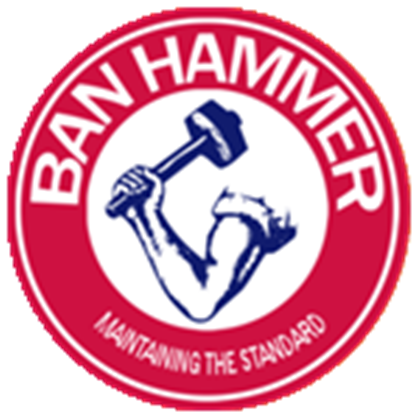 After all, for a standard legal card to get hit by the Ban-Hammer is pretty much unheard of. 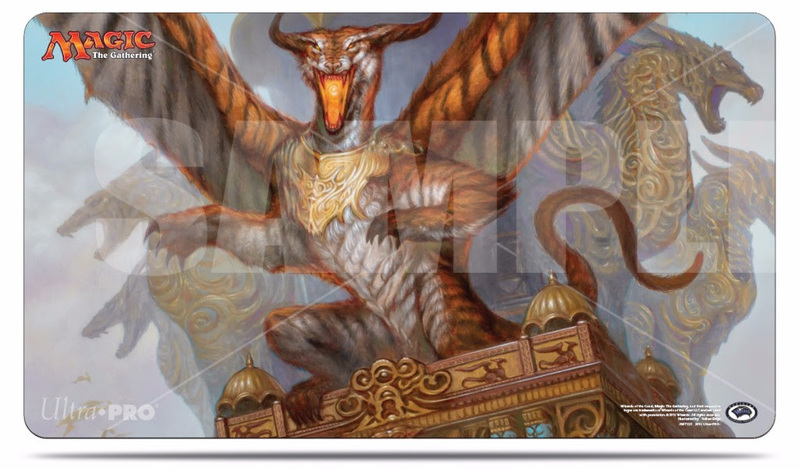 To this end, we want to draw your attention to the Exclusive Playmat being provided by StarCityGames.com Columbus Open event on Aether Revolt launch weekend of 21-22 January. It features the art work of none other than Smuggler's Copter, aka the 'Looter Scooter'. Unfortunate, and perhaps a bit awkward, but humourous to some none-the-less. Anywhoos, moving on, we should summarise the very sharp looking Aether Revolt gaming accessories brought to you by Ultra PRO gaming. Deck Boxes, Deck Protectors (card sleeves), binder and a wallop of play mats featuring aesthetic arts in this upcoming MTG set. 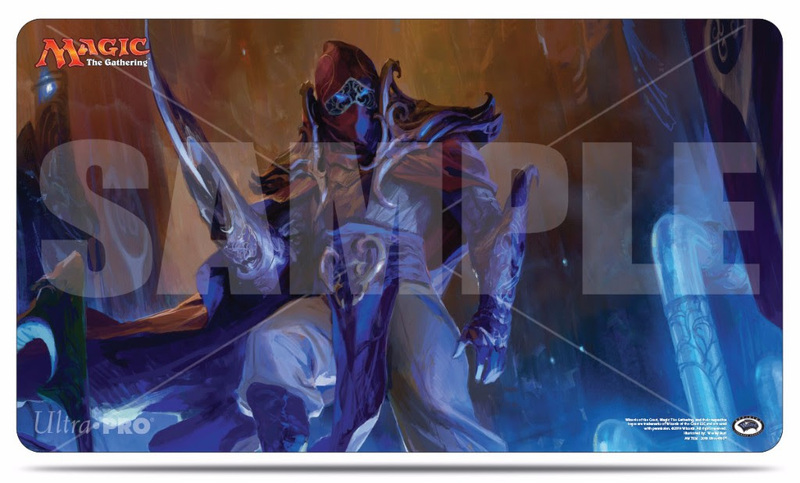 Also available are Aether Revolt 6ft and 8ft Playmat / some call this 'Table Play Mat' for Magic: the Gathering (approximately 72" X 30" or 96" X 30") featuring the Aether Revolt key art work. 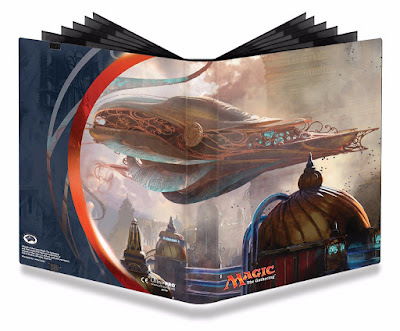 Magic Aether Revolt PRO-Binder, features Heart of Kiran, illustrated by Jaime Jones and holds 360 sleeved cards. The black backing of the pages are textured for low friction and easier card insertion and removal, while an elastic strap holds the binder securely shut. Today, we want to provide our unbiased review for the hand-made Loki Deck Box from Asgard Gear. 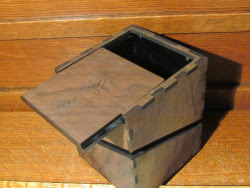 We've been rocking with this box for about a week now and have traveled with it from our lair thrice to develop an opinion. • Exterior Casing - material is natural wood - specifically Walnut. We've exposed the box to our regular use and have certainly Rustled the Jimmies. The shell is solid, durable and has not scuffed or taken on any visible signs of wear. • Joints - Not that that kind. 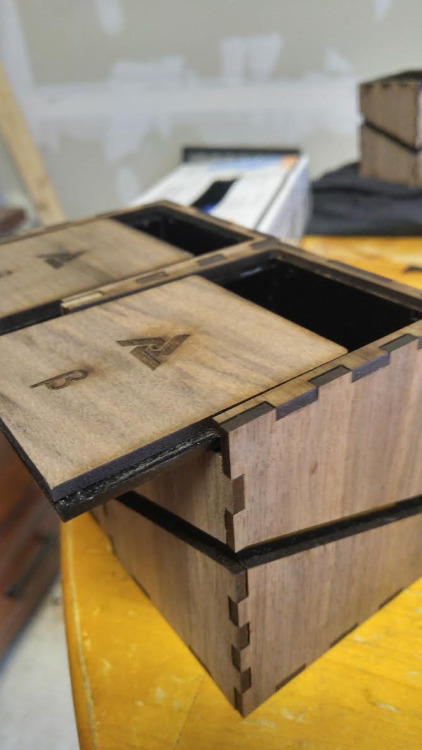 Given the thickness of wood, through dovetail joints are not very practical, so Asgard Gear went with box joints. All joints have wood adhesive and we're impressed with the work with the tricky work required for clamping. • Finish - Tung Oil. Walnut is a beautiful wood but unless it gets appropriate finishing, it could look just kinda meh. Tung oil makes the lovely grain here just pop. Benjamin Moore has been producing Tung Oil (from the Chinese Vernicia fordii tree seed_ since about the 1930's. In our opinion, this environmentally considerate oil delivers the very best finish availble. • Embellishments - All exterior wood parts are laser cut giving a very clean look. The crisp Asgard Gear logo, and Beta model marking are aesthetically pleasing. • Interior Casing - Acrylic plastic. Perfect choice of material to protect cards, sleeved or not, from acquiring any undesirable wear. Sleeved cards fit perfectly and slide out easily like snot on hot glass. • Closure - Separate flush-fitting top sliding closure secured with two neodymium magnets. These rare earth magnets provide a strong fastening. 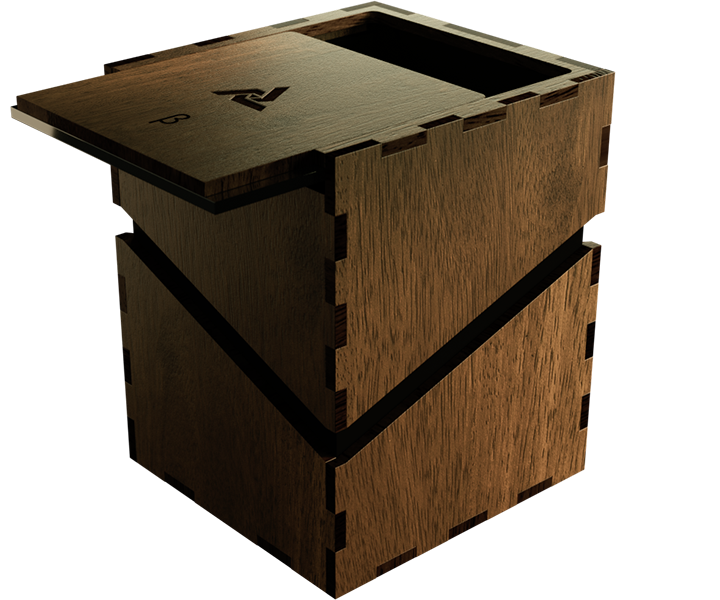 we could not get the lid dislodged with a highly scientific drop test from the height of a gaming table. We have preference to mag closures over exterior clasps which are more prone to damage. • The Asgard Gear Loki holds our sleeved 100-card Commander decklist perfectly. At the moment, it is holding our Emmara Tandris list and the literal crap-ton of tokens this list generates - beasts, snakes, saprolings and elves are all house comfortable inside and perhaps there is a comparative to Doctor Who's TARDIS somewhere here. 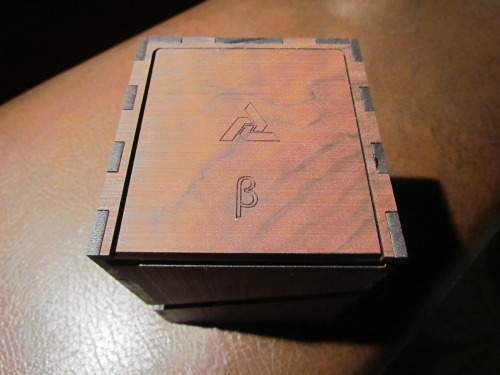 This is a great deck box and we love the look of it. The price for the Deck Box is about what we would expect to pay for a high quality card storage box. We do not have any complaints at all but would suggest that Asgard Gear should consider looking into offering gamers the opportunity personalise the deck box with their name, deck name or perhaps even a simple graphic. 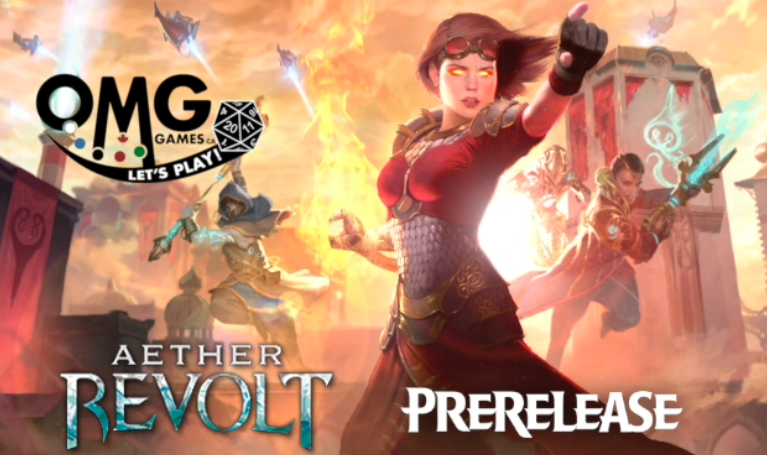 This weekend at the Magic: the Gathering - Aether Revolt PreRelease at OMG! Games here in Barrie, Ontario, there are a number of very cool random prizes up for grabs including the Asgard Gear Loki Deck Box. 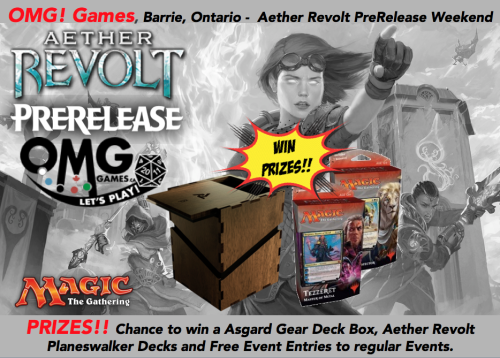 There will be draws every event for free entries to regular weekly events at the store, as well as a chance to win an Aether Revolt Planeswalker Deck (2 available), and the Deck Box.